Next to the snow-covered mountain on each Arrowhead bottle, is a list of “mountain springs” within. The actual Arrowhead landmark in the foothills of the San Bernardino Mountains. This is something I think about every day when I walk by the water dispenser at my office. I look at the snowy mountain top on the label, and mentally compare it to the actual Arrowhead landmark, in the foothills of the San Bernardino Mountains, which I drive by each week. This iconic landmark is made of coastal sage scrub plants: white sage, black sage, california buckwheat, and others (Meek, 2007). Ironically, what makes the arrow stand out from the surrounding chaparral is the grey foliage that advertises the ability of these plants to survive drought. Our remaining native ecosystems hang on a very delicate balance, and surface water and groundwater play an important role in maintaining this balance. 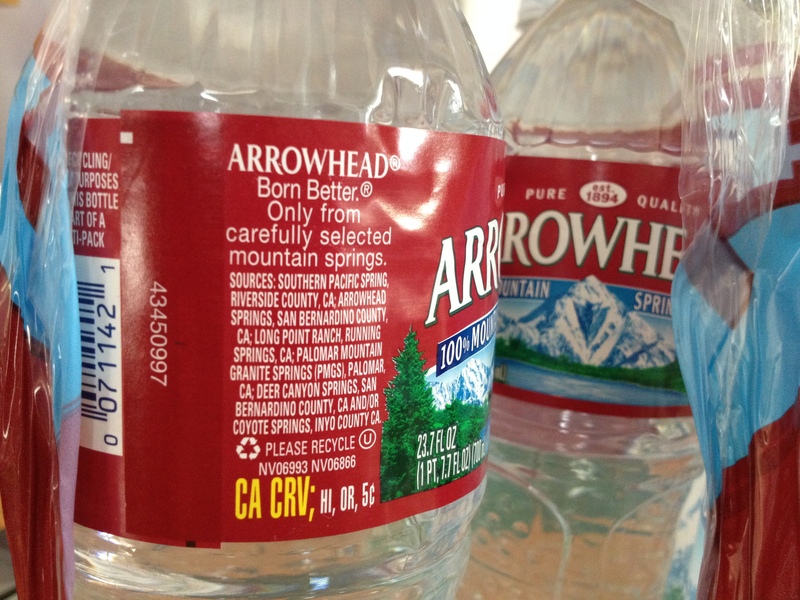 This is just one of the reasons I feel alarmed when I see the list of “mountain springs” listed on the side of Arrowhead bottles. Because I suspect the other places on this list do not look anything like the snow-covered mountain on that label! 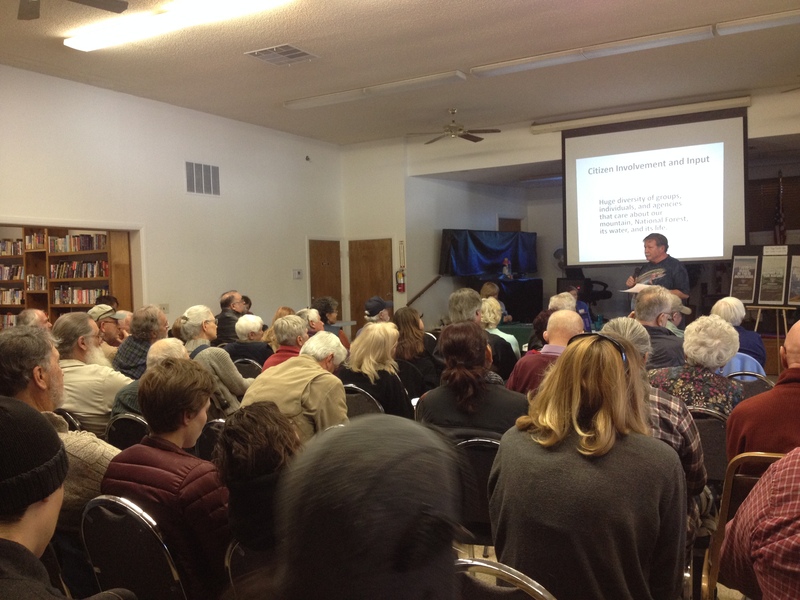 Steve Loe, a retired San Bernardino National Forest biologist, speaks to a packed house. Last Sunday, I went to a community hearing sponsored by The League of Women Voters and Save Our Forest Association to learn how Nestlé’s extraction of water from the San Bernardino National Forest impacts Strawberry Creek, its riparian ecosystems, and our local groundwater. Speakers addressed a packed house at the Senior Center in Twin Peaks. Strawberry Creek is the creek associated with Arrowhead Springs, after which Arrowhead water is named. 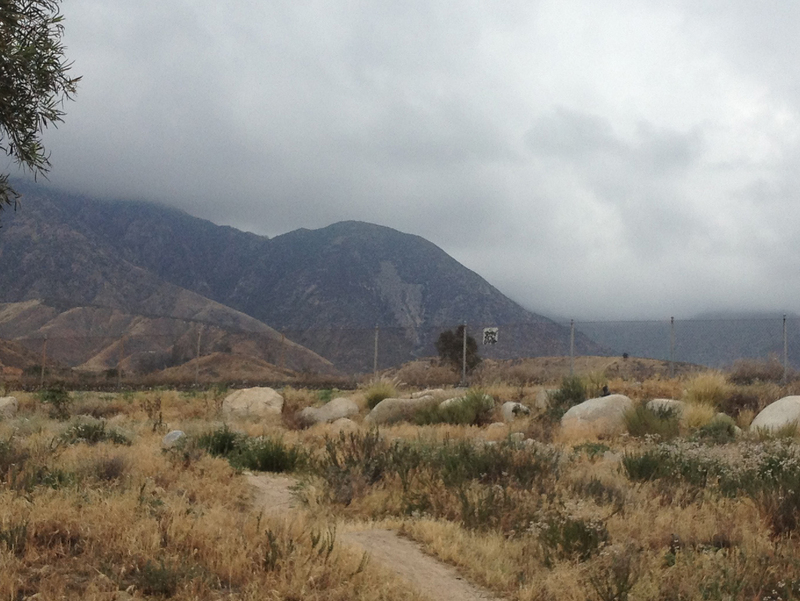 It is located in the foothills of the San Bernardino Mountains. Over the last 68 years, Nestlé extracted an average of 62 million gallons per year from wells drilled into the upper watershed of Strawberry Creek. According to figures presented at the hearing, this is over 5% of the safe yield of the entire San Bernardino Basin, which supplies the cities of San Bernardino, Riverside, Redlands, and others. 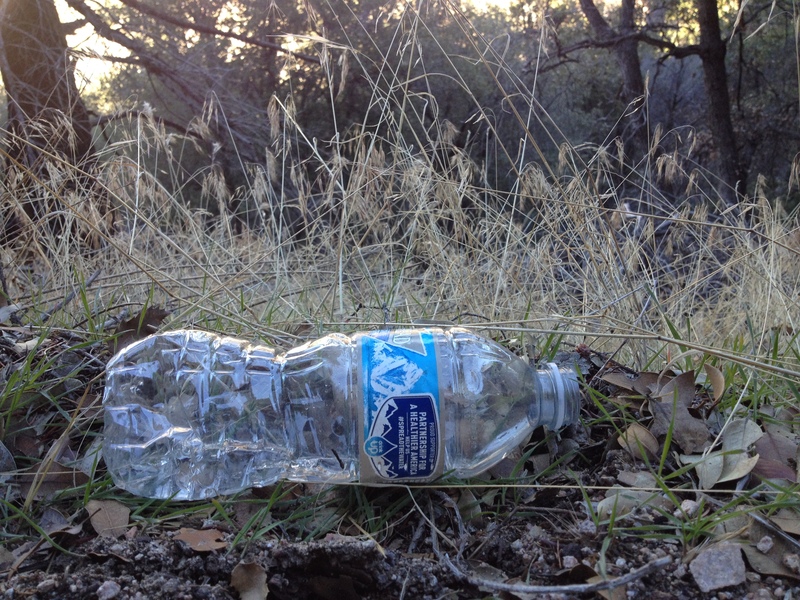 Even in the midst of a multi-year drought, in 2015, Nestlé extracted 36 million gallons. Nestlé’s extraction of millions of gallons per year occurred even as residents and businesses were required to restrict their own water usage. For this amount of water, the company paid only $524 each year. One speaker said this came out to $3.65 per acre-foot of water, which the company then sold for 100,000 times that amount. 36 million gallons extracted in 2015, in the midst of a multi-year drought, means that much water did not make it to the creek. This means all of the plants and animals that once lived in the creek are short that much water. Loe made it clear that the “mountain springs” of Strawberry Creek are not artesian springs which leap out the ground. Rather, they are horizontal wells drilled over 500 feet deep, maximizing groundwater extraction in the creek’s upper watershed, before water even gets to the creek. The drill sites are so dry that no riparian vegetation appears in their vicinity. 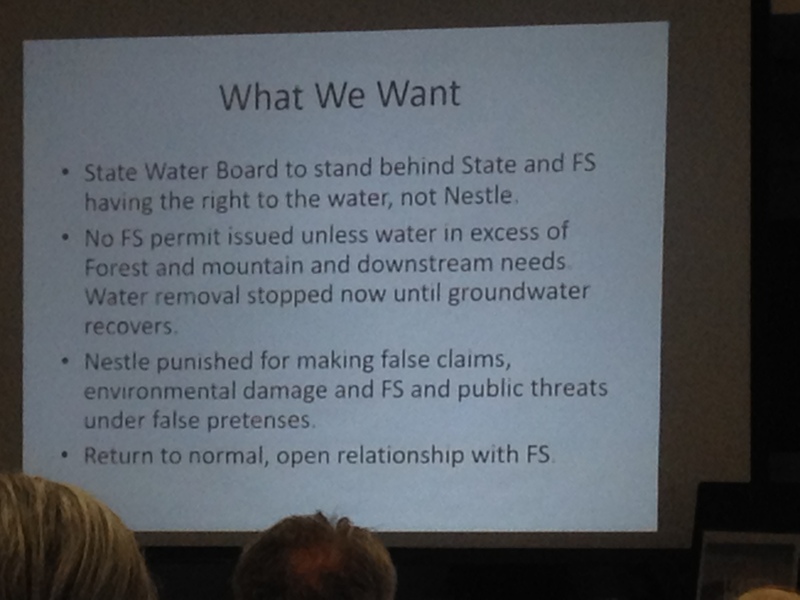 Nestlé claims to only extract water that is in ‘excess’ of the Forest Service’s current and foreseeable needs. Given the outsized importance of riparian habitats in contributing to local biodiversity and providing regional ecological connectivity, Loe asked, can one say there is excess water when a creek is close to its lowest flows on record? Species that depend on riparian habitat are at low population levels, and others historically associated with the San Bernardino Mountains, have disappeared. Loe believes Nestlé’s extraction of groundwater was a contributing factor in the disappearance of Santa Ana speckled dace, a native fish species, from the area after 2003. The co-sponsors of Sunday’s hearing: League of Women Voters of the San Bernardino Area. I always love the Desert Sun’s coverage of environmental issues: Bottling Water without Scrutiny. Meek, N. (2007). 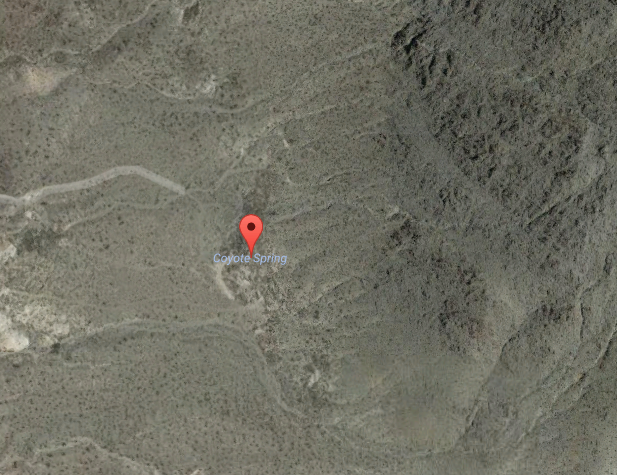 Origin of the Arrowhead landmark near San Bernardino, California. California Geographical Society. Coyote Spring, Inyo County, another of the springs listed on the Arrowhead label. Thanks for this very informative piece. We already know that Nestle has for years been pushing baby formula, which is often mixed with polluted water from nearby streams, in the Third World. I hope the Center for Biological Diversity can make some headway. Nestle Corp (aka George Soros) is buying the rights to as many sources of Fresh Water on the Planet that they/he can get their hands on! You are currently reading In every bottle, a creek… at L.A. Creek Freak.